Librarian. Optimist. Military Spouse. Reader. This summer, I took a Youth Services in Library Environments course that included a one-week residency at Syracuse University. In the class were the usual mix I’ve come to expect in my library & information science classes at the iSchool–a wonderful mix of students from around the country who represent a wide variety ages, backgrounds, and life experiences. The difference in this mix was that we were joined by four educators from Rwanda who are working to bring a reading culture to their country as part of a larger initiative called Vision 2020, which strives to transition Rwanda to a knowledge-based society . 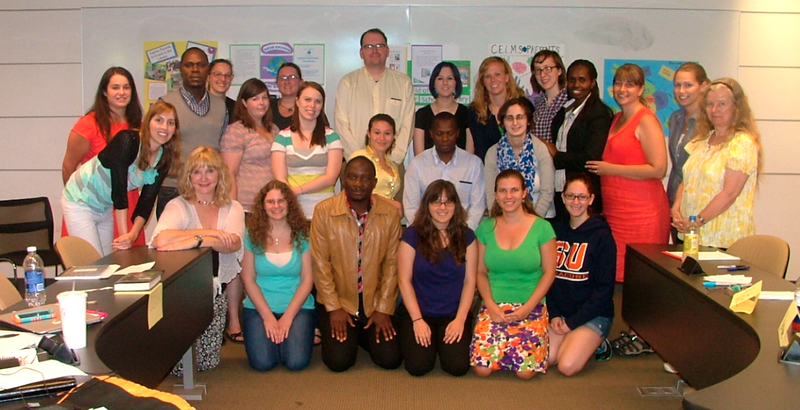 You can read a little more about our new colleagues in the Syracuse University News article Rwandan Students in Residency for Teacher-Librarianship Training. As you can imagine if you have looked at even a few of my previous blog posts (and especially if you know me in any other context), this is exactly the kind of Change the World One Step at a Time project that I am passionate about. The opportunity to gain an understanding of another culture, and to contribute in some way to help people develop their own culture that values reading as a foundation for enjoyment, enrichment, and knowledge creation is a project that will undoubtedly provide learning opportunities on all sides of the collaboration. I am privileged to be in classes with my Rwandan colleagues again this fall and am looking forward to learning from them, as well as hopefully contributing in some small way to their goals. If you would like to explore a few articles and web sites about the current opportunities and challenges Rwanda faces in creating a culture of reading, please visit my Rwanda: Creating a Culture of Reading Pinterest board. If you are interested in helping by sharing ideas about libraries, education, literacy, reading, and strategies for increasing book accessibility (in Kinyarwandan and English) and the love of reading, please visit Wikispaces: Rwanda, Dream Big Read Big and become a member of our brainstorming and idea-sharing wiki. TURACYARI KUMWE: We are still together.